Microsoft has announced that in the near future, Windows 10 will require a sizeable allocation on your device for Reserved Storage, which will be used to handle future updates to the system. As much as 7GB of hard drive space could be sacrificed for the Reserved Storage allocation. That’s equivalent to enough storage for nearly 2,000 10Mp photos. The move will upset those that have limited storage space on their computers, or anyone who is already put out by the sheer storage impact of the operating system itself on their drive. Still, if you’ve been doing some spring-cleaning on your Windows device, ditching old apps and that dodgy copy of AvengersInfinityWar-2018-XViD-WebRip from your hard drive, then good news – you’ve just made space for Windows 10 to stretch its legs in the near future. 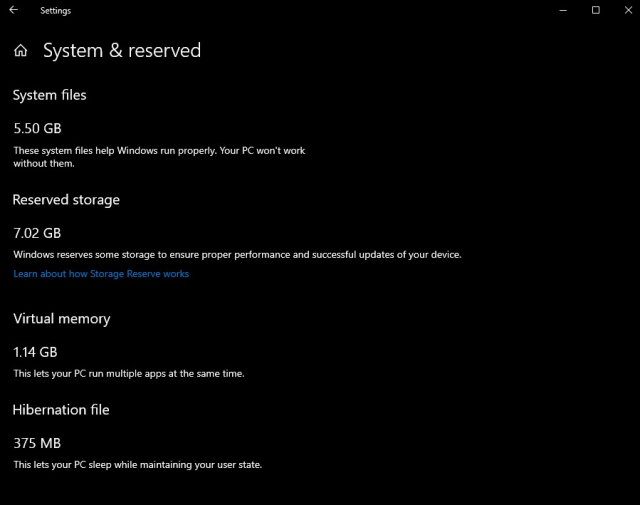 What is Reserved Storage for Windows 10? In a blog post on Microsoft’s site, the OS giant states that the update will reserve a portion of your storage for any future updates to Windows 10. As anyone who has used a Windows device in the past few years will know, these updates tend to come thick and fast. For your computer to be able to run smoothly, Microsoft wants you to be able to install these straight away. The problem comes when your storage space is already full, and you are forced to delete files to make space for the updates. As far as Microsoft is concerned, this new move is mutually beneficial – Microsoft can be sure that a large number of its users are running the latest Windows version, and users won’t have to regularly find space by deleting old files. With Microsoft claiming that the Reserved Storage will take require around 7GB though, it’s a big chunk of space to lose, especially on top of the existing Windows 10 installation, which can be around 20GB and beyond. It also causes massive issues for those working with limited space already due to hardware restrictions. What Problems Could This Cause? If you’re rocking a computer or device with lots of storage space, then this move probably won’t bother you. The Windows operating system has always been something of a behemoth, after all. Windows 95 took up 50MB back in its heyday. That might not seem much now, but at the time most people had precious little storage to play with. We’ve come to expect Windows to be a resource hog over the years, but the introduction of Reserved Storage is a whole new issue. The problems occur for those running devices that can’t spare the storage. This includes popular notebook devices that offer the full Windows 10 experience on the cheap, thanks in part to smaller, inexpensive storage. The Asus e203, available as your local Best Buy, is one of the poster boys for an inexpensive laptop that can be picked up for just $150, and it’s a great choice for students. However, with just 32GB onboard storage, it will struggle to accommodate Microsoft’s demands. At best, you’ll have next to no storage left for your own files and apps. At worst, it’ll be unable to make room for future updates. The there’s those running Windows tablets, which traditionally don’t have huge storage space, either. Even if you have a ‘traditional’ computer or laptop, there’s a chance that you’re using a 128GB solid state drive, a popular choice for manufacturers. Add the additional 7GB needed for the Windows installation to the 7GB needed for Reserved Storage, and you’re looking at losing over 20% of your storage space. Can I Block Reserved Storage? Microsoft has stated that the Reserved Storage feature will be automatically introduced in future Windows versions, and implemented as standard. One thing that isn’t covered in the blog post update is if users will be able to turn the feature off. We would hope so. You’ll be able to have some say in just how much room the Reserved Storage will take, by handling the optional features of Windows 10. Once the update has been installed, you’ll be able to head to Settings > Apps > Apps & Features > Manage Optional Features to remove those that you never use, and reduce the footprint of the reserved space. Similarly, you can uninstall the languages that you don’t use, so that Windows doesn’t put aside space for these. While realistically, many with larger drives are going to be non-plussed to lose 7GB, anyone with limited space could run into serious problems if not allowed to manage this feature independently. When Will Reserved Storage Be Implemented? Microsoft has stated that anyone with a new device that has the 1903 build of Windows 10 running on it will see the feature straight away, ditto those who have done a clean install of this version. For everyone else, the feature will be introduced with the next major update. Code named 19H1, it’s expected to drop in April this year, following the Windows 10 pattern of two big updates annually.